The UK labour market report for November will be watched on Tuesday at 09:30 GMT for the latest view on unemployment and wage growth in the Brexit-hit economy. While happenings in Westminster will be the main focus for investors, another solid set of jobs data could provide some support for sterling amid the deepening Brexit uncertainty. Britain’s unemployment rate was unchanged at near 4-decade lows in the three months to October at 4.1% and is expected to stay at that level in November. 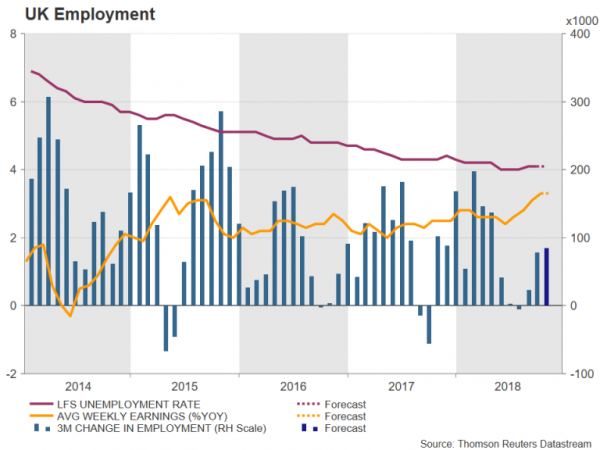 Despite businesses holding back on investment decisions due to Brexit clouding the outlook, the impact hasn’t been so evident in the jobs market and firms have continued to hire, albeit at a slower pace. Employment growth picked up speed in September and October after stalling in the summer months. Total employment is forecast to rise by 85k in the three months to November, slightly above the prior 79k. Attracting the biggest attention though on Tuesday, will be the latest estimates of wage growth. The annual rate of change in average weekly earnings accelerated to a 10-year high of 3.3% in the three months to October. It’s expected to hold at 3.3% in November, while the rate that excludes bonuses is also forecast to remain unchanged at 3.3%. An unexpected slowdown in earnings growth would fuel concerns that the UK economy is stagnating as Parliament’s deadlock on the Brexit Withdrawal Agreement rumbles on, taking a toll on both consumer and business spending. However, if pay increases maintain momentum, it would reassure worried traders that rising household incomes could offset at least some of the negative hit from the Brexit uncertainty and the weakening global economic backdrop. In forex markets, the pound could resume its recent upswing against the US dollar should the employment data point to further tightening in the labour market. The British currency could re-challenge last week’s 2-month high of $1.30, though it would first have to overcome nearby resistance at the $1.29 handle, which is the 123.6% Fibonacci extension of the downleg from $1.2814 to $1.2436. A successful break above these levels could see traders eyeing the 161.8% and 200% Fibonacci extensions, at $1.3048 and $1.3192, respectively, especially if the positive numbers are accompanied by signs of progress by Theresa May in securing concessions from the EU to help her sell a revised Brexit deal to UK lawmakers. However, if the job figures disappoint or underwhelm and all the indications are that Parliament remains split on how to proceed with Brexit, sterling could slip below immediate support in the $1.28 region. A breach of this support would bring the 78.6% Fibonacci into view at $1.2733, while lower down, the 61.8% Fibonacci at $1.2670 would be the next focus. Even sharper losses could see the pound testing the 50% Fibonacci at $1.2625. GBP/USD: What Doesn’t Kill You Makes You Stronger?